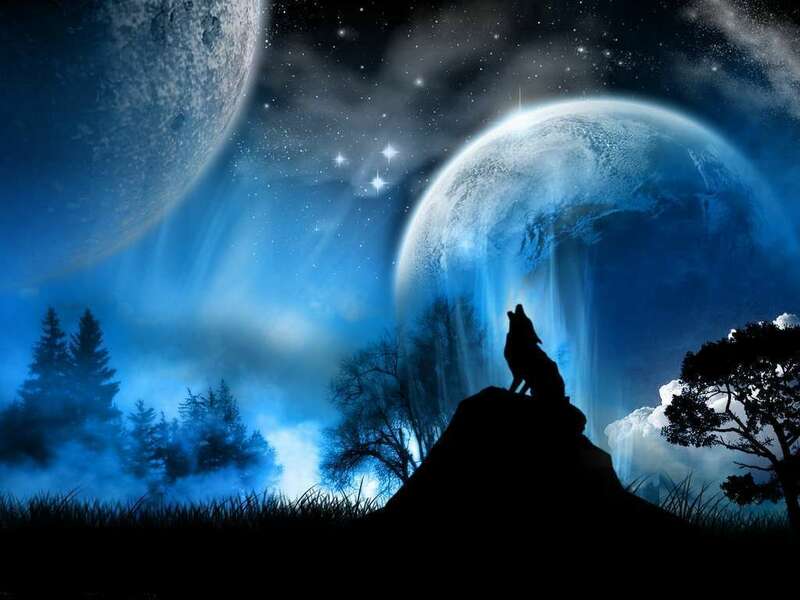 There are 14 posts in this thread, and it has been viewed 9865 times. Is Wind Jammers any fun? 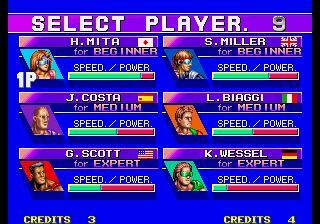 Windjammers is an arcade game released by Data East on the Neo Geo arcade system in 1994. The game is based on an actual real world sport, called 10-S, using a flying disc. The game mechanics are essentially the same as Pong or Air Hockey; with either three or five points scored depending on where the disc hits the wall behind the opponent, or two points scored if the disc hits the ground before reaching the wall. 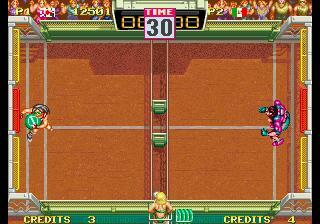 Each sets lasts thirty seconds or ends when one player reaches 12 points. The winner of the match is the first player to win two sets. A tie gives each player credit for one win. If players are tied two matches in a row, players go to a sudden death round where the first player to score wins the match. Finally! Wind Jammers aka Flying Power Disc is GotW! Most players might get a mediocre impression of it because they just try the story mode - and I totally understand that thought. It gets actually quite boring after the first completion and even the cool mini games can't change this fact. The real quality of this game however is definitely the terrific 2P mode. Just jump in with a buddy and experience a top-of-the-range challenge! After all Wind Jammers is my favorite version of Pong and one of my favorite 2P mode titles on the Neo�Geo. Awesome game! Easily one of my favorites on the system. The NGCD rounds go for 90 seconds rather than 30 for some reason. I have yet to play this with a friend, but the single player offers plenty of challenge, enough to keep me entertained for hours. Absolutely a blast with a friend! I used to play this game every day after school with a buddy for hours. So simple, yet so fun. Single player unfortunately, isn't nearly as fun, and nowadays I rarely am able to get people over to play 2 player like the old days! Definitely one of my favorites on the Neo though.. love the music and voiceovers. This game is also very well suited for the Neo CD controller. Its an original game no doubt but defo a 2 player thing as I found it a bit dull when I played it on emu but its a game that I know is held in very high regard. I would pick it up on NGCD at the right price. I just tried it out and to be honest, it seems quite boring. The graphics and music are good, but the characters are dull and it really doesn't seem to be that much different from Bang Bead and Battle Flip Shot to me. Then again, I have yet to try it out in 2P. Which, from what everyone says, seems to be the best part of the game. I've never played this game, though I know it has a reasonable sized following. I suppose I never bothered to play this because I was neither a big fan of BangBead or Battle Flip Shot, they really are not that bad, but they really never held my attention. 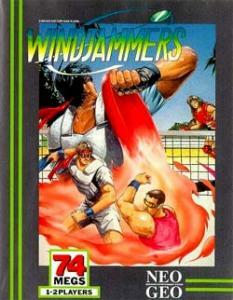 Is Windjammers better than either title I mentioned? I'd like to play a little of this 2P. This is a true old school arcade experience. Simplistic gameplay with high fun factor! One of my favourite NeoGeo games. Wish they could release this on Xbox Live. Would be great fun to play against others online! 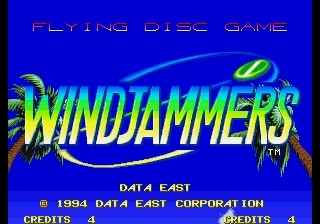 Hi there, I'm writing this here because I'm seriously searching for (very) strong challengers in this game, Windjammers Flying Disc game. I never played against a very good opponent (except for BBH), and I've always won the sets I did. Please, if you're good in the game, let me know it, and we'll be able to set some games of high level (ggpo or supercade. Note that I've got very good ping and connections overseas are 99% of the time fluid and smooth). If you think you're better than me, please tell or forever be silent ! 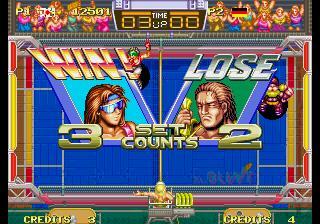 Windjammers is on my top 5 favourite Neo-Geo games!!! There is no neogeo gaming session without a match with Windjammers! In light of the coming PS4 port of the Neo Geo goldie Windjammers an online beta has been announced. The following video features the French world-champion Keikun and even pro-wrestler Austin Creed a.k.a. Xavier Woods. Crazy stuff. Even if it's a DotEmu port, it doesn't seem halfway bad. It's also a good thing that with the digital release more players worldwide will get to know this epic party popper. Speaking of France, the game seems to be a huge hit over there. In the last years several active communities appeared in the web, doing either Kaillera matches or locally on cabs / Neo Geos. On a personal note, during a visit to France in 2011 I happened to see a Candy Cab featuring Windjammers in a local arcade. It was surrounded by cheering people who totally went nuts.